For many of us, our first introduction to Chinese food came through dining at a restaurant featuring Cantonese cuisine. It's hardly surprising that Cantonese cooking was the first Chinese regional cuisine to take hold in the United States. After all, the original Chinese immigrants were mainly Cantonese coming to work on the railroads in the 1800's. But what is it about Cantonese cuisine that sets it apart from China's other regional cooking styles? Why makes it China's "haute cuisine"? When it comes to ingredients, Cantonese cooks are fortunate to live in an area with abundant rainfall and a tropical climate. The province of Guangdong is a major agricultural area, while Guangzhou city, known in the west as Canton, is a major Chinese seaport located on the Pearl River. Lush rice paddies abound throughout the Pearl River Delta. There are also several pig and poultry farms throughout the area. However, the Cantonese are also very inventive, and happy to incorporate non-native ingredients in their cooking. Coconut milk, rice noodles and curry powder, staples of Thai and Indian cuisine, show up in several Cantonese dishes. An emphasis on preserving the natural flavor of the food is the hallmark of Cantonese cuisine. A Cantonese chef would consider it a culinary sin of the highest order to produce a dish that was overcooked or too heavily seasoned. I was reminded of this one time while shopping at an Asian market. The vendor took great pride in demonstrating the freshness of the ling cod - killed a mere three hours earlier - by pointing out that you could still see its heart beating. Unfortunately, Cantonese cooks have had difficulty reproducing their native cuisine in a foreign land. As cookbook author Eileen Yin-Fei Lo points out in an interview, the first immigrants were men, coming from a society where women traditionally did all the cooking. Furthermore, faced with unfamiliar ingredients, they made adaptations that were less than successful. Dispensing with the step of blanching vegetables prior to stir-frying resulted in soggy vegetables, which they covered up by adding extra cornstarch. To hide the lack of natural flavor in the dish they overcompensated with seasonings such as sugar and soy sauce. American-style Cantonese cuisine was born. Of course, the fact that westerners gradually developed a fondness for "Chinese junk food" didn't help matters. Fresh fish and shellfish, rice, tropical fruit such as mangoes and lychees, and a wide array of vegetables are readily available. Rice is the staple crop; sweet potatoes (yam), taro and wheat are also cultivated. While water chestnuts are used throughout China, they are more popular in the south. In addition to seafood, the Cantonese diet includes beef chicken and pork (while western versions often have little in common with the original, Sweet and Sour Pork is an authentic Cantonese dish). No Cantonese kitchen would be complete without a bottle of oyster sauce, made from boiling oysters and seasonings. (Vegetarian cooks can use a vegetarian version made with mushrooms). Chinese fermented black beans (also called salted black beans) and shrimp paste also figure prominently in Cantonese cooking. Hoisin sauce, made by mixing soybean paste with spices, is used as well. At home, steaming and stir-frying are two important Cantonese cooking techniques. Given the emphasis on freshness in Cantonese cuisine, it's not surprising that steaming is popular, as this is the least intrusive cooking technique and the healthiest. As for stir-frying, the Cantonese are the acknowledged experts. Cantonese cooks believe every stir-fry must exude a taste and aroma that comes from having wok hay or "wok breath". Besides stir-frying and steaming, Cantonese cuisine is also famous for its roast meats such as pork and duck. Char siu bao, or steamed buns filled with roast pork, is a popular Cantonese dim sum treat. Beef with Oyster Sauce is a typical Cantonese dish, as is Steamed Chicken with Ginger Scallion Sauce. Steamed sea bass, stir-fried garoupa, and Lobster Cantonese are all well-known Cantonese dishes. Shark's fin soup is a local delicacy. 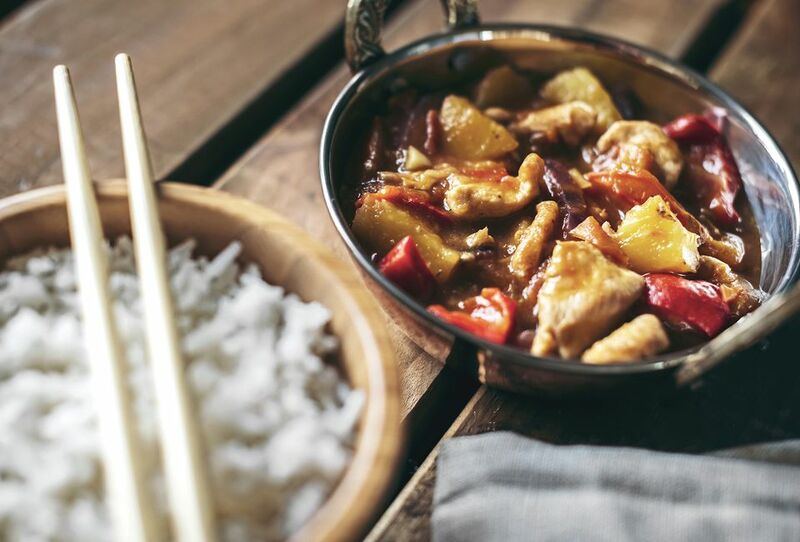 Curry chicken, made by simmering chicken, curry powder and vegetables in coconut milk, shows the influence of Southeast Asian cuisine on Chinese cooking. Vegetable dishes reflect the wide variety and seasonality of what is available. Along with freshness and quality, artistic presentation of the food and garnishing are also very important in Cantonese cuisine.